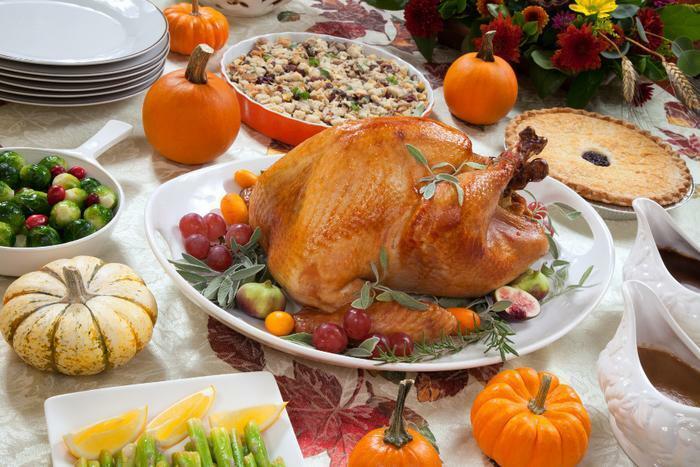 Thanksgiving is a day of gratitude, but it can also be a day of overindulgence. The health effects of a heavy meal can be exacerbated by remaining sedentary after the meal has ended. It may be tempting to plant yourself in a recliner for the remainder of the day, but venturing outside for some physical activity can help mitigate the effects of a heavy meal. Georgia Giannopoulos, manager of health and well-being at New York Presbyterian, recommends going for a walk or bike ride in the morning. Getting outdoors, whether you do so before or after your meal, is just one of the ways to have a healthier Thanksgiving. Consumers can also improve the health of their holiday by watching what they eat at the table. If you’re traveling on Thanksgiving day, consider bringing healthy snacks for the road or plane. Kicking off your day with the mindset that you have to “save room” can lead to overindulgence once the meal is underway. At the table, health-conscious individuals can look for healthier alternatives to popular Thanksgiving foods. For instance, you can reach for a baked potato instead of marshmallowed sweet potato. Giannopoulos says making this swap will help you eat fewer carbohydrates and less brown sugar. Using substitutes for salt can also help you have a healthier Thanksgiving. If you’re the cook, consider using herbs and spices instead of salt. Good pairings for turkey include parsley, rosemary, thyme, and/or sage. It may be a day centered around turkey, but non-meat eaters can also get their fill. Many vegetables are in season in November. Staples such as broccoli, cauliflower, carrots, beets, brussels sprouts, and collard greens look right at home at any Thanksgiving table. Fortunately for those in need of gluten-free options, many Thanksgiving foods (including turkey, sweet potatoes, and brussels sprouts) are naturally gluten-free. However, sometimes these foods can be mixed with ingredients that contain gluten. If safety is a concern, consider having your gluten-free guests bring a gluten-free dish to share. Capping off your holiday meal with a dessert is perfectly fine, said Jennifer K. Nelson, a registered dietitian and director of clinical dietetics at the Mayo Clinic. Just be sure not to overdo it. "If you've got your eating under control for the majority of the time, go ahead and have a piece of pie — just don't lose control entirely," Nelson told MyHealthNewsDaily. "Keep your willpower and your wits about you." Instead of pecan or chocolate pie, reach for fruit pies which typically have fewer calories. You could even consider bringing a healthier pie to share, such as Vegan Pumpkin “Cheese” Cake or a lower calorie pumpkin pie.